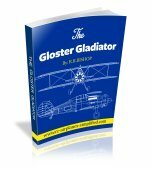 THE TYPES OF RC MODEL AIRPLANE COVERING AVAILABLE AND HOW TO APPLY THEM. 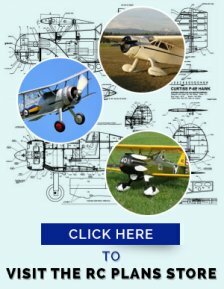 There are many types of RC model airplane covering and I shall attempt to explain the different types available and which one to select for your particular model. All the types discussed here are of the Iron On type. It is still possible to cover your rc airplane with silk and dope but the modern iron on types make life a lot simpler and can create a lot less smell! covering material will "hide" bumps and dips or any example of poor workmanship. Sand the framework well and fill all gaps and cracks with a light weight filler material. Take your time and do not rush this process!Plan how the model airplane covering will be applied and make sure there is framework to iron the model airplane covering to, especially around hatches and the tail surfaces.Fully sheeted surfaces need to be sanded by using a sanding block or tool. Using the hand alone will result in non-flat surfaces. Over the years I have made all kinds of sanding blocks of different shapes and sizes for many applications. They are generally made of plywood and use an adhesive backed sandpaper. Generally two grades of sandpaper are utilized. 100 grit is used for the initial shaping and 200 grit is for the final smoothing.When you are satisfied with the finish of the airframe, the final step is to remove ALL the dust you have just created with all that sanding! 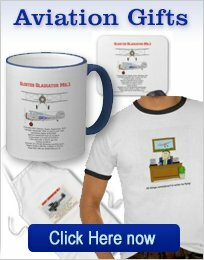 Thoroughly blow and vacuum the airframe, the workbench and yourself! It is amazing, how HUGE the smallest speck of dust can appear to be after it is covered!I usually prefer to cover prior to final model assembly. This means that all control surfaces are covered as separate items, along with the wing panels and tail surfaces. The hinging of all controls is finalized after covering.Before you start the covering process, carefully read the manufacturer's instructions. 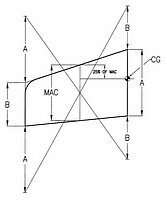 They will include the different temperatures for bonding the covering to the framework and shrinking the material. These temperatures are important! I purchased a Coverite Pocket Thermometer a few years ago and have found it to be indispensable in setting covering temperatures. The Coverite pocket Thermometer is in stock. Tack the edges and gently stretch the material around the shape of the part, with no creases. Iron down the edges firmly. Shrink the material. Note that this is done at a higher temperature than the initial tacking and bonding. Keep the iron away from edges as they may tend to soften and lift. 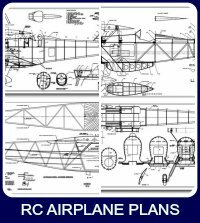 The first type to consider is the plastic film type of model airplane covering. The most popular being Top Flite Monokote This material has a high gloss, smooth finish. It is hard to beat for covering sports models, giving a long lasting, durable finish. 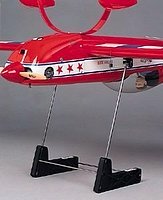 Its application for scale models is probably limited to the modern aerobatic types and civil aircraft. 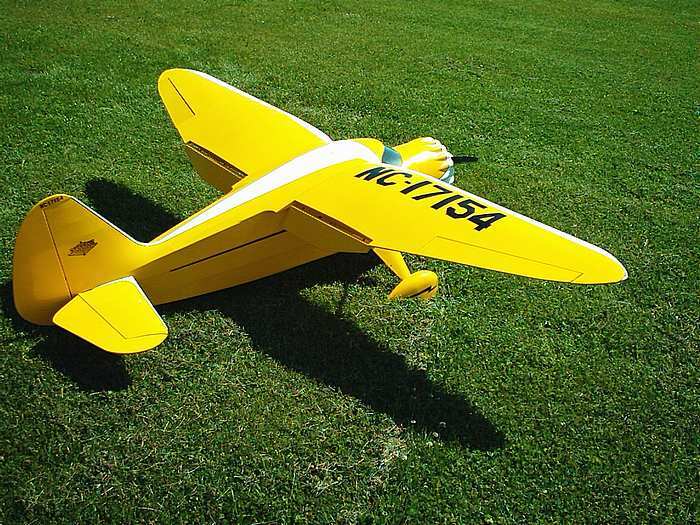 It should be mentioned that the film type of RC model airplane covering material, produces the lightest model. Another type of plastic film is Ultracote, offered by Hanger 9. This is a polyester type and the gloss of the finish is not quite as high as that offered my Monokote. All the film types are impervious to air and some form of venting has to be used. 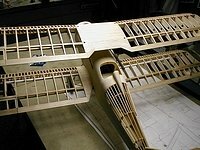 A pin hole in each wing bay, for instance can alleviate the pressure. Bubbles forming during the stretching and sealing over sheeted surfaces can be pricked and ironed down. However, keep this technique to a minimum. There is a special tool called the Top Flite Woodpecker Perforating Tool that will produce tiny holes in a balsa surface, prior to covering, that can help this problem. For scale models of aircraft that are fabric covered, this type of model airplane covering can produce a very realistic finish. Being a fabric, this material is not quite as prone to air bubbles as the films. It is available as a natural color that can be painted or it can be purchased as a fabric that is finished with a semi-gloss paint. The photo of my Top Flite Stinson Reliant, shown at the top of this page is covered with a pre-painted fabric, available from Coverite. It is referred to as 21st.Century Fabric. The great advantage of this material is it is a one step process. It produces a beautiful finish that simulates the original aircraft. The white trim you see in the photo is monokote applied directly over the fabric. The model is now several years old and has been flown many times. The model airplane covering looks as if was applied yesterday! The last two models I have built have been fabric covered then painted with Nelson Hobby Paint. This paint is a polyurethane that is thinned with water. I applied the paint with a foam brush and the results have been outstanding! I do not have the ability to spray, so I have stayed away from painting my models. This paint has made a convert out of me! It is fast drying, completely fuel proof and dries with no brush marks. Follow the instructions supplied and you will be delighted with the results! For more details on this model-The Curtiss P-6E Hawk, take a look at this page.